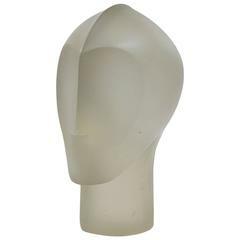 This Ancient Greek Satyr's Head Sculpture is no longer available. This exquisite piece represents the head of a bearded faun, clearly depicted with his goat horns and elongated ears. 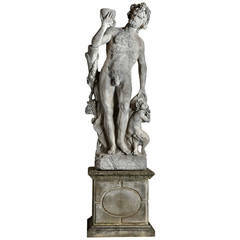 The faun was the Roman equivalent of the ancient Greek satyr, a mythological half human-half goat creature, manifestation of forest and animal spirits that would help or hinder humans at whim. 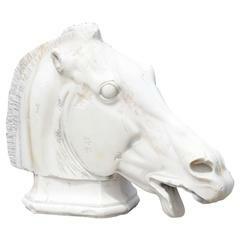 The use of bronze with the lost-wax casting technique and a green patina resting on a marble pedestal, adds a touch of classical allure to any decor. Midcentury satyr sculpture of Pan. 20th century concrete coveted patina Classical Greek Goddess garden sculpture. Features great detail in the draping of her dress, her hair and grapes in her hands and at her feet. 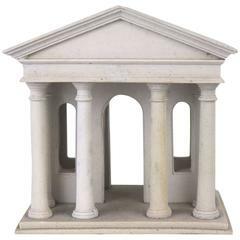 This eagle sculpture is made from Portland limestone and includes a slate base which is measure: 60 cm x 35 cm. The eagle is decorated with crests. Carved Carrara marble statue of a satyr & maiden on marble plinth from a Black Rock, CT estate on the water. Italian. 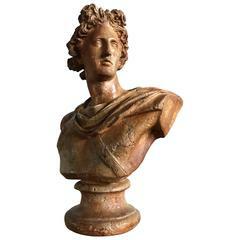 An antique bust of A Greek God. The weathered and worn bust having all the markings of fine antique sculpture. Wonderful detail and design.